All the information on the internet doesn’t feel like just a tool though. It feels like it is part of my memory, my own processor. If Google can answer a question then I can answer it. Google answers the simplest math equations. When I was a kid, I remember math teachers dismissing calculators, especially TI-83s and beyond, because the calculators did the work for us. Some exams would be “without a calculator”. Teachers felt as if the small machines were handicapping us. But I don’t think that’s the case. Sure, Google will make us worse math students. I can’t deny that. Isn’t the internet a resource for all human knowledge, though? Doesn’t that make it an accessible part of our brains? Yes, it is possible we will lose our biological memory capacity. But future scientists might be researching crowdsourced knowledge as we speak. She might be exploring the causes for cerebral palsy. The spark might be lit. Maybe that one kernel she found when she was 14 will slowly cook and at 24 she will be isolating genes and looking at cross-sections of cells. So Encyclopedia Britannica goes out of business, so what? Most troubling for a writer though is how to use certain features. For instance, there is a built-in thesaurus and dictionary on my laptop. Both good things to have. Microsoft Word corrects grammar, including passive language and fragments, and misspelled words. In fact I can rely totally on Word to correct the spelling of any word I am not sure. (This is a curious correction suggested by Word: “internet” should be spelled with a capital “I”. There are all kinds of philosophical implications of spelling internet with capital “I” that are way above my head.) Here is the fear: am I using my computer a crutch? Even “The author combined with machine”. One might be wont to call these creeping habits insidious in nature, but they are quite unobtrusive. The internet is our translator and thus our passport around the world. Think about it: our base experiences, our thoughts are transmitted through language. Language is often the largest barrier between cultures. Now, a translator application can bridge the gap. The machine in our pockets to the words in our mouth. One disturbing trend for the merger is the amount of songs about parties that aren’t fun. It would be a whole lot easier to be at home, on my computer, so these songs go. Is this a symptom of our addiction? Or are the parties really that lame? The sense of relief you get when you open up your laptop after being on a plane. Is that feeling not shared with the pothead who needs a bong rip in the morning? The nights slept next to a computer screen. Is that unlike the gambler asleep at the slot machine? The exciting sound of a new piece of mail in the mailbox: the first drop of alcohol in the morning for Geoffrey Firmin in Malcolm Lowry’s Under the Volcano. 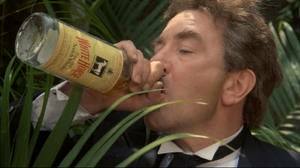 Geoffrey Firmin from Under the Volcano having a morning Tequila swig after an all-night soiree. It will certainly be a tempered battle humans and the human-machine merges. Maybe we will become less aware of the technology observing us and therefore less self-referential of the medium. Meta-narratives will disappear as cameras show up on every street corner, in every home. We will always be on stage and so we will never have to act as if we are on stage. And we’ll always have the internet when we falter. This entry was posted in The Word and tagged Computers, Future scientists, Internet addiction, Man and Machine, Wikipedia. Bookmark the permalink.